The global economy is increasingly interdependent. In this new economic environment, lowering trade barriers and finding trading synergies is important. Ideally, the World Trade Organization (WTO) should provide a framework for global economic integration. However, the Doha round of WTO talks is currently at an impasse. As a result, trading partners in the Asia-Pacific are turning to bilateral approaches, like free trade agreements (FTAs) or regional trade agreements (RTAs) to lower trade barriers. According to the WTO, some 462 RTAs/FTAs had been notified to the WTO as of February 2010. The overall number of RTAs/FTAs in force has been steadily increasing. Taiwan sees the region all around it integrating via bilateral agreements. ASEAN, for instance, has signed FTAs with three of Taiwan's top East Asian trading partners: mainland China, South Korea and Japan. ASEAN also signed an FTA with Australia and New Zealand as well as an FTA with India last year. On January 1, an FTA between 10 ASEAN members and mainland China came into effect creating a free-trade zone consisting of 1.9 billion people and a combined GDP of nearly $6 trillion. And since the outbreak of the global financial crisis two years ago, the ASEAN Plus Three forum coordinating cooperation between the 10 ASEAN members and mainland China, Japan and South Korea has gained prominence. While ASEAN is only one of some competing models for Asia-Pacific regional integration, it signals a trend of bilateral approaches that Taiwan cannot ignore. We must not allow ourselves to become economically marginalized. The need for Taiwan to seek greater integration is obvious. Trade is Taiwan's lifeline. Exports alone were nearly 54 percent of our total GDP in 2009, and 64 percent in 2008. Trade is unquestionably essential to Taiwan's economic survival and growth. All this has been accomplished by seeking prudent, pragmatic and timely solutions that avoid zero-sum outcomes. It has also been achieved by negotiating on the basis of parity, mutual respect and mutual benefit. Now it is more possible for Taipei to build partnerships for greater economic integration with the entire region. Currently, Taiwan's largest trading partner is mainland China. Two-way trade with the mainland (including Hong Kong) was nearly 29 percent of Taiwan's entire external trade in 2009. The East Asia area (adding in Japan and South Korea) accounted for 47 percent, Asia as a region (adding in ASEAN) accounted for close to 60 percent, and the entire Asia-Pacific region (adding in primarily the United States), more than 71 percent. Clearly, the Asia Pacific region is vital to Taiwan's economic future. Given that Asia is now considered the brightest area of economic growth following the global financial crisis of the past two years, greater participation in regional economic integration is crucial for Taiwan. Conversely, any attempt at regional economic integration that fails to include Taiwan in a meaningful way will hold the entire Asia-Pacific region back from attaining its full potential. Taiwan is one of the world's largest suppliers of contract computer chip manufacturing and is a leading manufacturer of LCD panels and a number of other electronic products. In short, Taiwan needs regional economic integration, and regional economic integration needs Taiwan. Therefore, building the necessary partnerships in the region is essential to prevent marginalization and to foster healthy regional economic integration. For instance, we signed an Economic Cooperation Framework Agreement (ECFA) with mainland China on June 29. It is actually just one of 14 cross-strait agreements signed since President Ma took office in 2008. ECFA is designed to institutionalize cross-strait economic relations, allow Taiwan products a more level playing field in the mainland market, and make Taiwan more internationally competitive. The ECFA is not an end in itself. It is a cornerstone for additional agreements to be worked out later in such areas as investment, trade in goods and trade in services. It includes tariff waivers on certain traded goods and preferential market access. In all, 539 of Taiwan's tariff items are on the initial "early harvest" list, along with 267 mainland tariff items. Once the ECFA comes into effect, it allows for the two sides to subsequently work out additional agreements to expand the number of tariff-reduction or elimination items and to further institutionalize cross-strait investment. The ECFA will require revising some domestic laws in Taiwan, so our national legislature is currently reviewing it this July. This gives elected representatives of the people a say in its approval. President Ma has said that signing the ECFA has major significance for Taiwan, cross-strait relations, the Asia-Pacific region and the world. It is a giant step forward in terms of overcoming Taiwan's economic isolation, mutually beneficial cross-strait trade and cooperation, and speeding up the economic integration of Asia. While signing the ECFA is momentous, it is just the first part of the process, not the end goal. There are many other partnerships to build. As a WTO member, Taiwan has the right to negotiate member-to-member FTAs. And following the ECFA signing, President Ma has made holding FTA talks with Taiwan's other trading partners an administrative priority. This government has done everything reasonable to reach out to the other side of the Strait, dispel misunderstandings and build confidence. Our concerted efforts to ease cross-strait tensions have reduced uncertainties in one of Asia's traditional flashpoints. As cross-strait relations improve, constraints on Taiwan's international room for maneuver should continue to be loosened. Our policy of "flexible diplomacy" includes a "diplomatic truce" with Beijing. This allows both sides to end zero-sum competition for diplomatic partners, frees up resources and is consistent with the spirit of improving cross-strait ties. For instance, following the devastating earthquake in Haiti at the start of this year, my government and the Taiwan public jointly pledged 18.5 million dollars worth of disaster relief funds and humanitarian supplies to Haiti. This assistance plan for Haiti covers such areas as public health, housing, job creation, and the adoption of orphaned children. Public health is another area in which Taiwan has been able to redeploy its resources on behalf of the international community. Taiwan's inclusion in the World Health Organization's (WHO) Global Outbreak Alert and Response Network has enabled us to more effectively interact with the international community and receive information in a timely manner. Taiwan has established a Mutual H1N1 Vaccine Storage Center to store our remaining stocks of H1N1 vaccine to share with the international community. At the World Health Assembly in Geneva this year, we pledged to donate 2 million doses of the vaccine to Guatemala. My government's striving for more meaningful participation in UN-affiliated agencies such as WHO is a natural result of our democratic progress. The bedrock of democracy is popular representation. Meaningful participation in such organizations by officials of my government is essential. Only then can the interests of the Taiwan people be genuinely voiced in such key international bodies. In turn, Taiwan can then share its considerable expertise with the international community and contribute to joint solutions of global problems. American support of meaningful participation for Taiwan in the WHO, United Nations Framework Convention on Climate Change and International Civil Aviation Organization is crucial and warmly appreciated. Asia's economic importance has grown since the global financial crisis of the past couple years. This means that the United States has a greater stake than ever in the stability and prosperity of the Asia-Pacific region. The enduring partnership between Taiwan and the United States remains a key part of the story. Since the change of the relationship between the United States and the Republic of China in 1979, the people of America have worked with the people of Taiwan to forge remarkably strong substantive ties. One concrete symbol of this, the Taiwan Relations Act of 1979 (TRA), recognized the longstanding friendly ties between Taiwan and the United States. It also affirmed the importance of free and unfettered trade between Taiwan and America. And crucially, it stated "the expectation that the future of Taiwan will be determined by peaceful means." For more than 30 years, the TRA has successfully assured that trade ties between us have continued to prosper. In 2009, the United States was Taiwan's third-largest trading partner, with 11 percent of our total two-way trade. Historically, that figure has been much higher. Many of our exports to mainland China are re-exported to the United States, so our trading ties are even more substantial than that trade figure would imply. As my government works to integrate Taiwan even more into the regional economy, this is an opportune time for Taiwan and the United States to sit down and explore ways to take their robust trading partnership to the next level. This could involve a further look at a Trade and Investment Framework Agreement approach, or other ways to achieve this goal. The Taiwan-U.S. partnership is about more than just trade. Taiwan has already secured visa exemption from the United Kingdom, Ireland, Japan and New Zealand. The European Commission has proposed granting Schengen-area visa waiver privileges to Taiwan. This is still awaiting adoption by the European Parliament and European Council. We are also working for visa exemption from Canada and Australia, while Singapore and South Korea already offer landing visas. This is clearly an excellent time to work out a visa waiver agreement with the United States, given the high degree of interest by the people of Taiwan in traveling to America. For Taiwan and the United States, trade and security go hand in hand. The TRA has also provided crucial support for Taiwan's security as we achieved the transition to democracy. Taiwan's democratic achievement is a source of hope and inspiration. It unites the people of Taiwan regardless of their political views. We can and will defend our democracy, our rights and freedoms, even as we pursue institutionalization of economic relations with mainland China. Our democracy, however, is not a bargaining chip; it is non-negotiable. This is a point on which the entire Taiwan public is determined, united and resolute. Firm in this resolve, my government has reached out to Beijing with goodwill gestures to create the right conditions for improvement of relations. However, we remain mindful of the rapid buildup of mainland China's military. Taiwan still faces a significant security threat. This limits what goodwill gestures can do to spur public confidence in the benefits of cross-strait accords. President Ma has called on the Chinese mainland to stand down and withdraw the missiles aimed at Taiwan. Their deployment is not consonant with building a positive relationship. A credible military deterrence for Taiwan is essential to prevent any miscalculation that could lead to armed conflict. Taiwan's foremost security objective is to be self-reliant. However, Taiwan needs certain armaments that it cannot manufacture itself. According to the TRA, "It is the policy of the United States to provide Taiwan with arms of a defensive character." This was drafted to ensure that the cross-strait issue is resolved peacefully. The Obama administration's approval of the sale of $6.4 billion worth of defensive arms to Taiwan earlier this year would contribute significantly to the stability of the region and the sustainability of democratic development in Taiwan. Given that the global economy is growing increasingly interdependent, what happens in once far-off Asia now matters more than ever to the United States. Taiwan is located at a key point in the Asia-Pacific region. We know that our American friends are glad to see democracy take firm root in Taiwan and want to see it prosper. There is no reason why it cannot continue to do so even while Taiwan pursues better relations with mainland China. The people of Taiwan are proud of their democracy and will brook no intimidation of it. They are also consistent in their support of prudent pragmatism to ultimately find the wisest solutions to complex cross-strait issues. My government has resumed the dialogue with Beijing. It has also delivered concrete results to assure Taiwan a brighter economic future and a sustainable democracy. The situation is now conducive to building positive partnerships for greater regional economic integration. This includes working out FTAs with our trading partners, and more meaningful participation in U.N.-affiliated agencies. Our actions reaffirm and reinforce the shared values of democracy, freedom, human rights, free trade and peace that the people of Taiwan share with the United States. The sustained support and warm encouragement of the American people have been critical at each stage of building our enduring partnership. And they remain crucial as Taiwan strives to achieve greater regional economic integration in the 21st century. 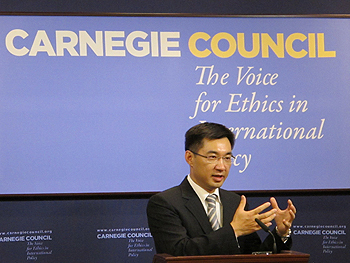 Johnny C. Chiang is the ROC Government Information Office Minister for Taiwan. This article is made up of selections from his remarks to the?Carnegie Council for Ethics in International Affairs ?and Overseas Press Club of America in New York City on July 13.